Hatters chief executive Gary Sweet has revealed the club turned down bids to the tune of over £2million in the recent transfer window. With young defender James Justin attracting plenty of interest before the deadline, with the likes of Brighton & Hove Albion and Leeds United said to be interested, there were also rumours of bids for Pelly-Ruddock Mpanzu and Akin Famewo too. 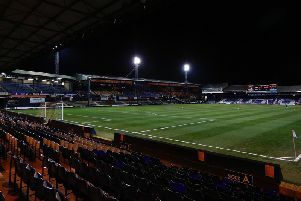 Luton were active in bringing in players ahead of the deadline, with Jake Jervis and Lloyd Downes signing permanently, Flynn Downes arriving on loan too. Writing in his programme notes ahead of Tuesday night’s fixture with Crawley Town, Sweet explained why no-one left the club during January, as he said: “In addition to our expenditure of a total value approaching £200,000 in January, we managed to avoid letting any of our top players go despite receiving bids in total of over £2.5m placed in respect of a few players. “There were a variety of reasons for these decisions. “Firstly, retaining the services of these players was important because we strongly felt we needed to keep the squad together for the all-important run-in, especially as injuries have taken their toll and could continue to do so. “However, it may be a different reason. “We generally accept that if a player develops more quickly than the club is able to, we are more than happy to help them progress to the right opportunity, at the right time, receiving the right amount of compensation without it negatively impacting our season. “We generally work hard to help this process if the inevitable situation is upon us, but alas, this couldn’t happen in January. "In any case, none of these decisions will affect the long-term aspirations of any player. “Adding three players without loss does bloat the squad to an uncomfortable level, or it certainly will do when our injured and suspended start to return." On the business done to strengthen Town's squad ahead of what is hoped will be a successful run-in, culminating in promotion to League One, Sweet added: "We have bolstered our resources by having another very good transfer window meeting our objective of strengthening the squad without losing any key players which we duly accomplished - not that it was all plain-sailing, I should add! “January is a horrific window where the treacherous traps and pitfalls are generally more common than the opportunities it presents and with 80 per cent of the month’s trading happening on the last day. “We’re very pleased with how we came out of it having signed two very good long-term permanent players and one highly-rated loanee."